It’s that time of the year.. when we fill our homes with food, laughter, and family. It’s also that time of the year when pumpkin is king. Chef Eleni shares her favorite holiday pumpkin recipe below for you to try out in your kitchen this holiday season. Enjoy! Spread chunks of croissants into the prepared baking dish. Mix raisins and dark rum together in a bowl; pour in just enough hot water to almost cover raisins. Let stand until raisins are plump, about 10-15 min or until almost all water is absorbed. 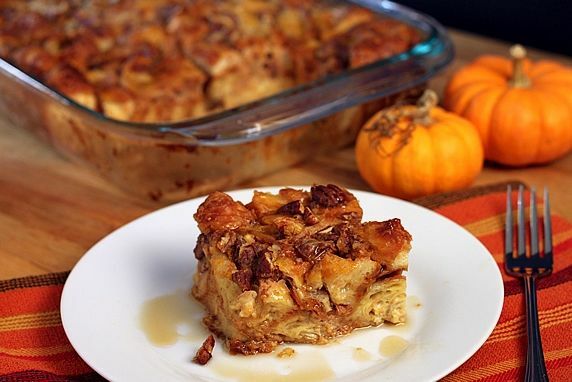 Combine well are ingredients: milk, pumpkin puree, sweetened condensed milk, eggs, raisin mixture, brown sugar, butter, molasses, vanilla extract, pumpkin pie spice, cinnamon, allspice, and ginger together in a large bowl until smooth; pour over bread. Set mixture aside until bread has absorbed the liquid, about 1 hour. Bake in the preheated oven until a knife inserted in the center comes out clean, 45 to 50 minutes or depending on your oven. Bread pudding should not be dry but tender and custardy. Bread pudding can be served warm with a caramel sauce and vanilla bean ice cream or a simple butter bourbon sauce. 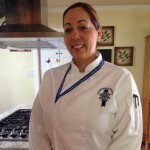 Chef and Owner, Eleni Malko has over 20 years of food experience. Self taught from the age of 11, Eleni has an immense love and passion of food, the best quality ingredients, locally grown and sustainable.Eleni Malko loves what she does so much that she went on to Graduate Le Cordon Bleu Culinary Academy with highest honors, top of her class. Excelling in culinary school is just another way for her to show that everything she does is done with commitment, determination, and gives 100 percent not to mention her love of food.